Special time slots are allocated throughout the week to cater for your emergency dental needs. Immediate treatment will be given to patients suffered from dental trauma. Whenever possible, we will diagnose your problem and provide treatment to get rid of your pain instantly. For more complex issues, further appointment may be necessary to provide long term solution. You do not have to be our patients to seek our emergency services. If your regular dentist cannot see you straight away, we are happy to assist with your emergency dental needs and report to your own dentist to follow up. If you have a dental emergency please contact us right away so that we can get you in as soon as possible. 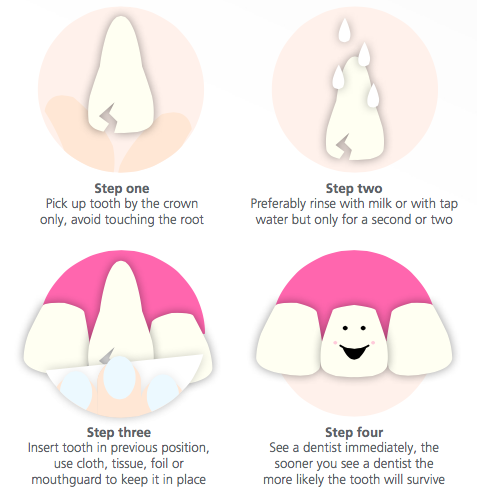 Step 1: Locate the tooth as quickly as possible and pick it up by the crown. Handle with care – avoid touching the ‘root’ of the tooth! Step 2: If dirty, rinse the tooth with some milk, or if milk is not available rinse using tap water but only for a second or two. Do not scrub or soak the tooth. Step 3: Insert the tooth back into its previous position in the mouth, making sure it is the right way around and in the right place. Compare it to the surrounding teeth to make sure you’ve got it right. Once it’s in, gently bite down on a clean piece of soft cloth or tissue to help keep the tooth in place. If it is ‘wobbly’, then folding a small piece of aluminium foil over the area can help keep the tooth in place, or if you have your mouthguard on hand, put it back into your mouth to stabilise the traumatized tooth. If you can’t get the tooth back in, don’t force it. Keep the tooth moist at all times by storing it in a small container with a small amount (enough to cover the whole tooth) of milk or saliva. Do not place the tooth in water. Do not wrap the tooth in tissue or cloth as this will dry out the tooth. Step 4: See a dentist IMMEDIATELY, ideally within 30 minutes. The sooner the tooth is replaced, the greater the likelihood it will survive. Step 1: If a child knocks out a baby tooth do not attempt to put it back in. Step 2: Seek an immediate dental examination, because dentists are best qualified to assess the damage and recommend the correct course of action. Take the knocked out tooth with you, so your dentist can ensure that the entire tooth has been knocked out and not just a part of the tooth. If you are unsure whether the tooth is an adult tooth or a ‘baby’ tooth, store it in milk or saliva and visit your dentist ASAP. Step 3: Attend regular dental check-ups so your dentist can monitor how the adult teeth are developing. Teeth can be cracked, chipped or become loose from accidents, and impact injuries can cause long term damage if not quickly assessed and treated by a dentist. If you chip your tooth, even slightly, always book an appointment to see your dentist and be sure to inform them over the phone that you’ve had an accident so they can see you as soon as possible. Try to collect any tooth fragments and transport them in milk to your dentist. If possible, your dentist may re-attach the fractured fragments to the broken tooth. Just because you can’t see any damage doesn’t mean it’s not there. A knock to the tooth or mouth can cause cracks in the teeth or their roots that will not be visible to the naked eye and will require an assessment by a dentist. If left unchecked, the damage caused by an injury can significantly increase the risk of infection, decay, and loss of the tooth.